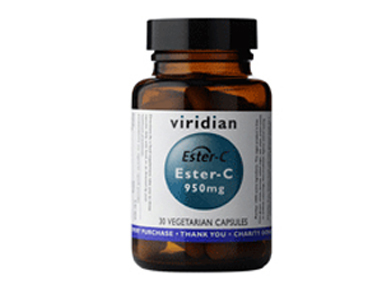 Buy Viridian Ester-C 950mg - 90 vegan capsules in the UK from our online shop or directly from our independent Scottish store. Ester-C™ is a neutral pH presentation of vitamin C, where the vitamin C is buffered to make it gentler on the stomach particularly where larger amounts are consumed. Where can you buy real Ester-C 950mg - 90's safely online? If you are wondering where you can buy Viridian Ester-C 950mg - 90 vegan capsules safely online in the UK, then shop with us. Ester-C 950mg - 90's - Viridian Ester-C 950mg - 90 vegan capsules in Vitamins A - Z and Vitamins and Minerals.